Allow your soul to journey into a profound shift in consciousness by looking inward. 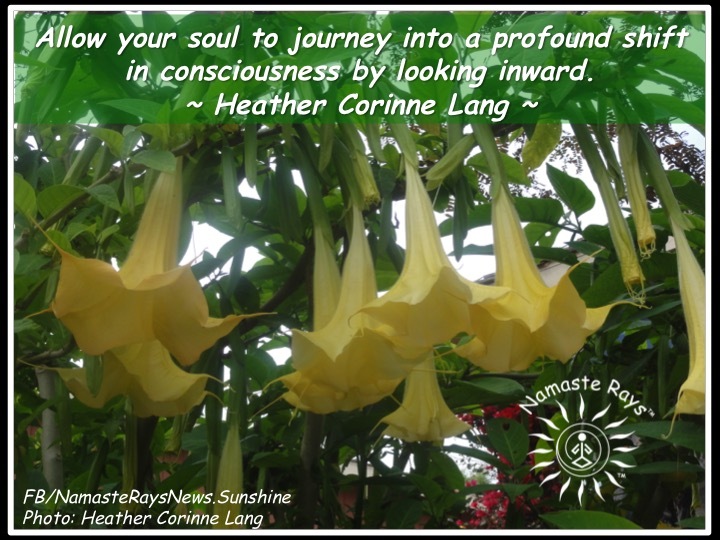 I love these angel trumpet flowers which are a message to shift your focus inwards and journey towards a profound and meaningful consciousness shift. This will challenge your current beliefs and help you look with new eyes, essentially changing your perspective on who you are, what your purpose is and what your true life path is meant to be at this time. Our paths are ours alone, yet as we shift into new understandings of self and thus, the world around us, the path expands towards something new. 2014 was a year of deep inner journeys, and 2015 is the year to put your new perspective and beliefs into action to expand your life path and manifest more of your dreams. In 2015 and each new day, we will still need to keep in touch with our deep inner being, because as we continue to move forward on our paths, expanding our dreams and manifesting the life we desire, more layers will come up. We will meet more people, both who challenge us and those who support us. Each will have the ability to teach us something new about ourselves to bring us more fully into our authentic selves. If at any time you would like help, support or encouragement, contact me for an appointment for Reiki Enery, Intuitive Guidance or a Tarot Reading. Any of these can provide you insight to heal and continue on your true life path. I wish you a year of blessings in abundance and prosperity in all areas of your life to help you expand your view of self and to continue to walk your true life path. You are welcome! And, thank you Alex! A very healthy & prosperous new year to you, Chris, and the rest of your family!